I spent quite a bit of time at the National Cartoonists Society website over the last few days... you see, I found out on Friday that I've been accepted as a member of the Society. If you could see me right now, you'd find my expression remarkably similar to the one on the face of the lady below. I'm absolutely giddy about this - at the same time, I'm also feeling a little stunned. Unlike Groucho Marx, I would like to be in a club that's willing have me as a member - especially this club! So this week, I'd like to express my gratitude to the NCS by showcasing the work of some of its luminaries, beginning with one of my favourite cartoonists, Hank Ketcham. 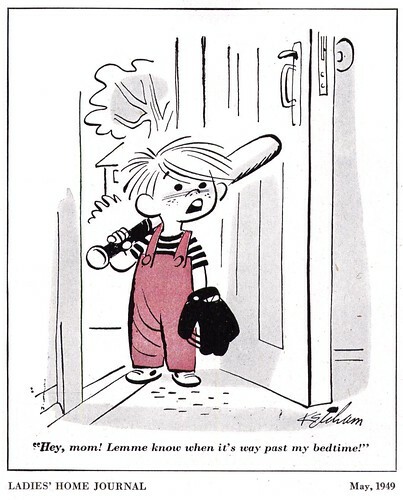 I've come across quite a bit of Ketcham's work in the pages of my old magazines, and every once in a while something really cool crops up - like this very familiar looking kid, who predates Dennis the Menace by about a year. In The Merchant of Dennis, Ketcham describes how he "hauled out the shoebox where[he] stored [his] gags, picked out a dozen kid ideas and feverishly translated them into rough pencil sketches" when he first got "the spark" for the mischievous tyke. Perhaps this kid was one of those that Ketcham referenced. And check out this Minute Rice model who bears a remarkable resemblance to Dennis' mom, Alice Mitchell. 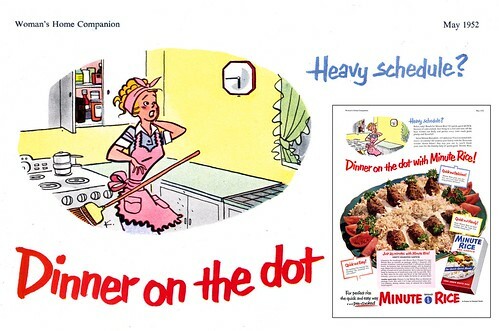 The strip had been running for only a year when Ketcham created the artwork for this ad. 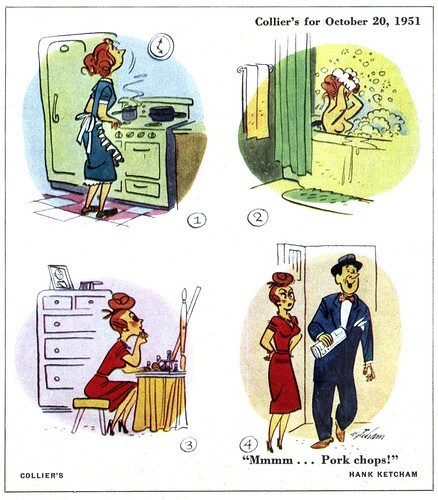 But most startling of all was this four panel gag from October 1951, a year after Dennis "was born". 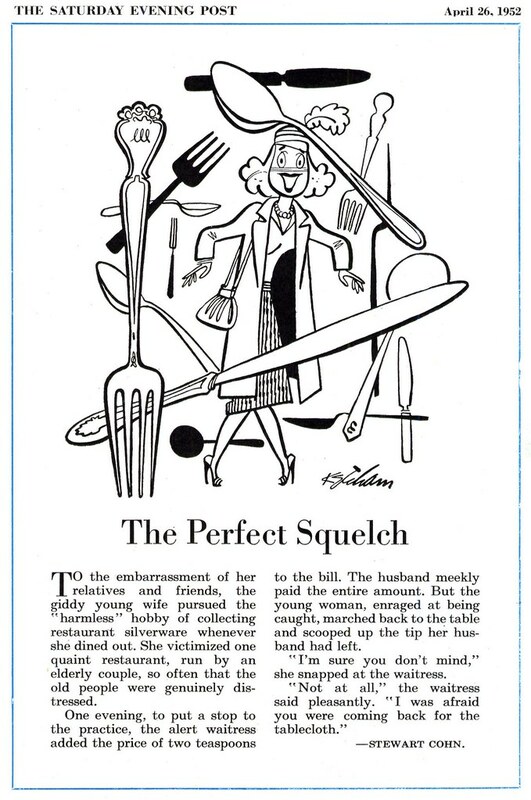 How in the world did Ketcham and Collier's magazine comics editor Gurney Williams manage to slip this one into print? I mean this might have been perfectly fine for Esquire magazine or Argosy... but Collier's? You'd think Ketcham would have been asked to strategically draw some bubble bath foam into this rather, erm, tittilating panel. My Hank Ketcham Flickr set. Leif, congratulations!! It's an honor richly deserved. Congratulations, Pen! You really deserve to be a member on National Cartoonist Society. 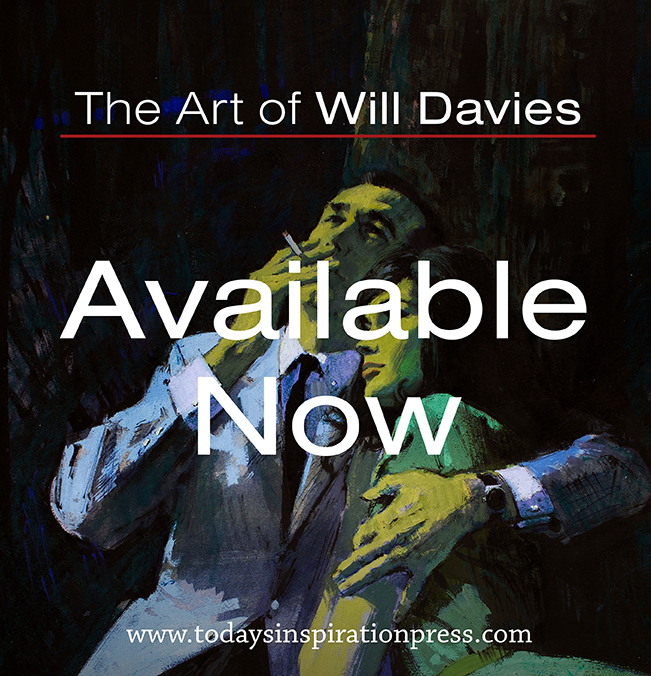 You make always a nice job rescuing from forgotten the art and life of real nice artists. Pau, the old tire ads collector from Barcelona, Spain. Congrats all around on your acceptance in the NCS, Leif! A membership well-deserved. And regarding Ketchum, I have an old jar of shoe polish and the box shows a running kid which was obviously illustrated by Hank. I found it in an antique shop about 15 years ago and that was when I discovered Ketchum had a thriving commercial career B.D. (Before Dennis). Congratulations Leif! That's fantastic! Something to be proud of indeed! Congrats on the NCS! I might be able to add a little to your Ketcham set. I was going through some of my dad's WWII photos, etc. yesterday and ran across a navy newsletter with (if I read the signature right) Hank Ketchum's signature. I'll scan them tonight and send them to you if you like. Jason, I would indeed very much like to see the newsletter image(s) - and thanks in advance for offering to scan 'em! I only wonder what took them so long? I am really happy for you, amigo. Wow, Leif. This is fantastic. Congratulations on this well-deserved honor! Congratulations on a well deserved honor, Leif!